One of the most difficult aspects of learning a new language is getting over the conviction that language learning is hard. Benny Lewis, the “Irish polyglot,” has made it his mission to disprove that conviction and help you to become bilingual … or polylingual! Each volume introduces the best language ‘hacks’ or techniques for beginners learning that language. The books retail at $49 each; however, follow the above links for a discount, as well a package offer in combination with Conversation Countdown which in effect throws in any one of the above eBooks for free! Or click the image for an offer on the entire series of six languages. The following summary is from a review copy of Why Spanish Is Easy. The language particulars would differ for each volume; the general approach to language learning carries over. As I alluded to above, the biggest hurdle in beginning language study is a matter of attitude, mindset, and approach. Language is essentially about communicating, and that’s something you can already do. In the early stages of language learning, perfectionism is your enemy. “Tarzan speak” works wonders. Children, for example, learn to speak single words, then short phrases. They are communicating long before they learn to construct correct sentences. Your goal is to speak from Day 1 and learn by doing. Most native speakers will encourage and support your learning. So, don’t be afraid to make mistakes. I know I have often been intimidated by the speed of spoken Spanish. The best way to get past that is simply listening and getting the sound of the language in your head. Benny suggests watching movies or TV series you know well with Spanish voice-overs and subtitles or listening to popular Spanish songs with the lyrics before you. The more you listen, the faster you will begin to pick out individual words. As for learning pronunciation, Spanish is way more logical and consistent than English once you get past the initial strangeness. Learn a few basic rules in the book, then practice emulating native speakers. Again, a variety of tools are suggested for doing just that. Here’s what makes Spanish especially easy. It is perfectly phonetic – no silent letters, variable diphthongs, or drawn characters to complicate things. Nouns have no cases – compared to four cases to learn in German or fourteen in Czech. There are no irregular plurals; just add an -s or –es. Unlike some languages (Chinese or Vietnamese for example), there are no tones to worry about. 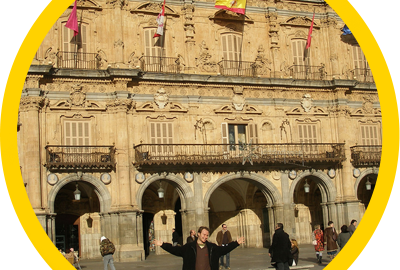 On the other hand, there are predictable stumbling blocks for beginners learning Spanish. Gender has nothing to do with gender. For example, “some words that imply ‘masculinity’ (virilidad, hombría, masculinidad) are actually feminine, and if that’s not confusing enough, the translation of ‘feminism’ (feminismo) is a masculine word!” As Benny points out, you could just as easily call them type 1 and type 2, A and B, or blue and red. He then provides a short list of word endings which will give you the correct gender almost all the time. And if you are wrong, people will still understand. Ser versus Estar, and Por versus Para. Spanish has two different words for the English verb “to be,” and two different prepositions similar to the English “for.” I’ve seen long detailed descriptions of when to use each. Benny cuts through the complexity with a simple mnemonic devices! Begin by learning words from a long list of English-Spanish cognates, word pairs like actor/actor, hospital/hospital, list/lista, nation/nación, history/historia, electricity/electricidad. Learn a short list of predictable changes in word endings, like -tion in English to -ción in Spanish. Develop mnemonic devices for learning troublesome words, or look up suggested mnemonics in Memrise. Employ spaced repetition (and not rote repetition) to speed up the learning process. These books are not language courses. They are an approach to learning which will adjust your mindset, provide simple efficient techniques, and show you where to focus your efforts to make your language learning as quick, effective, and enjoyable as possible. And, since every eBook comes with a 100% money back guarantee, you have nothing to lose! Why not learn more or pick up a copy today? You make me want to try and learn Spanish again. I was using a popular program a long time ago, and it had worked for me but I eventually stopped learning it. I agree some people speak Spanish so fast that it is hard for my brain to even process it, I use to watch certain shows on tv just to get a feel for it, the downside was that they didn’t have English subtles if only there was some way. I encourage you to jump back in and continue learning. One of the biggest keys is that you need to use your language skills. I have a lot of suggested resources on this site. Spend some time looking them over. Then, if you have any specific questions, just e-mail me and I’ll be glad to help. Arabic? Yes, indeed! Benny doesn’t have a separate book on Arabic in the Why Language Is Easy series. However, in his flagship program Fluent in 3 Months, Arabic is one of the primary languages supported! Check it out!